It was suggested just a few pages ago. SpaceEngineer said that will be implemented, of course. He also said that he could even implement them right now, but that it would move back 0.97.1 release date back by as much as 2 months. I'm actually anxious to play with the HUD that was featured in the earlier screenshots. I, on the other hand, am most anticipating the new moon generation, and the changes to water and additional types of planets with life are a close second. Guys, this is a development thread, not a request thread. Those are all things in the update though. I was wondering about the new water with noise, I guess all the planets with oceans have now this new effect? Is there a possibility that some worlds with strong gravity, heavy fluids and weak winds can't have such small waves effects on their ocean's surfaces? 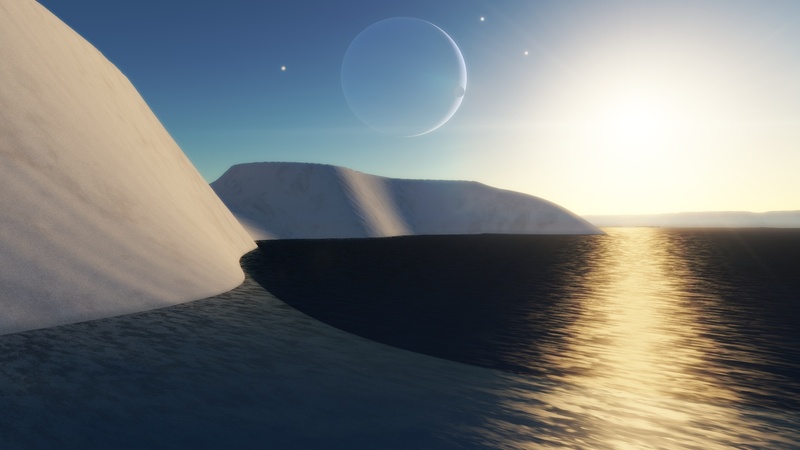 As reported in the article quoted by Solaris, maybe we have just to wait for the right season to see waves on Titan. Agreed! The universe and its properties are the true draw for me, and everything that can be generated. For me, the water is the most fascinating to me, so far. That, and the changes to the textures! I just tend to get excited and "OMG SHIPZ!" over spacecraft. I need to read back several pages. I've obviously missed some things. Why isn't this 0.98!? There's so much new amazing content! And there are very few second-decimal-place digits left before it hits 1.0 - which usually indicates a feature-complete computer program. Space Engine is astounding and mind blowing as it is, but it is not feature complete. I'd say it's still in alpha, maybe on the cusp of beta. The 0.9.7 series may come to represent the close of the Alpha phase, and the 0.9.8 series will lay the groundwork for beta. Then maybe 0.9.9 will be revisions that come out of the beta testing process, leading to a 1.0 release, which Space Engineer seems to intend to be some kind of hyper-real scientific space exploration game. That's at least a few years off. This is all supposition, of course. I know nothing. Nobody, sorry for my being stupid. What about the diffraction spikes for planets? They've always seemed really, really out of place to me.